Written by Demetrios Pogkas on 13 October 2015. 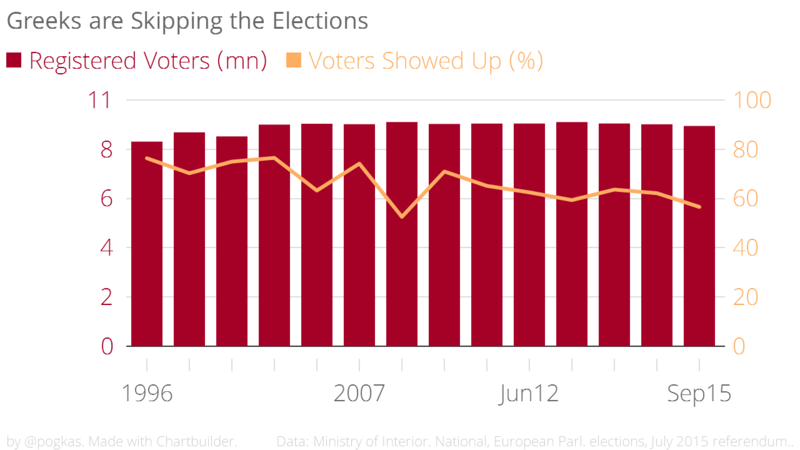 Greeks went to the ballots on September 20th for a third time in 2015, following the snap election of January and the referendum of July. The result took everyone by surprise; SYRIZA, the ruling party that agreed on the country’s third bailout package before calling for the election, won Nea Dimokratia by 7,5 pp, a difference polls before the elections didn’t manage to identify, allowing Alexis Tsipras to form a second government with his previous ally; Anexartitoi Ellines’ Panos Kammenos. The snap election of September 2015 in Greece is already forgotten history as it proved maybe one of the least interesting in the last decades (at least since I began following elections as a kid), with the final result being cleared out just 2 hours after the ballots closed. Early results transmission through wireless devices1 and the fact that the electorate was voting for parties only, as the members of the Parliament would be defined from the parties’ lists2, took all the fun away. However, there are some interesting aspects of the political and social environment in Greece that could be extracted from the recent election, which I’m pointing out in the graphs below. Post-World War II/Civil War Greece was dominated by a volatile political environment with frequent elections and government changes, caused by the division between Right and Left, the suppression of big percentages of the population, the interference of the royal family in politics and the role of the army as a controlling power in the political developments. This climate led to the 1967 military junta seizing power up until 1974, when the Turkish invasion in Cyprus led the army’s generals hand power back to politicians. 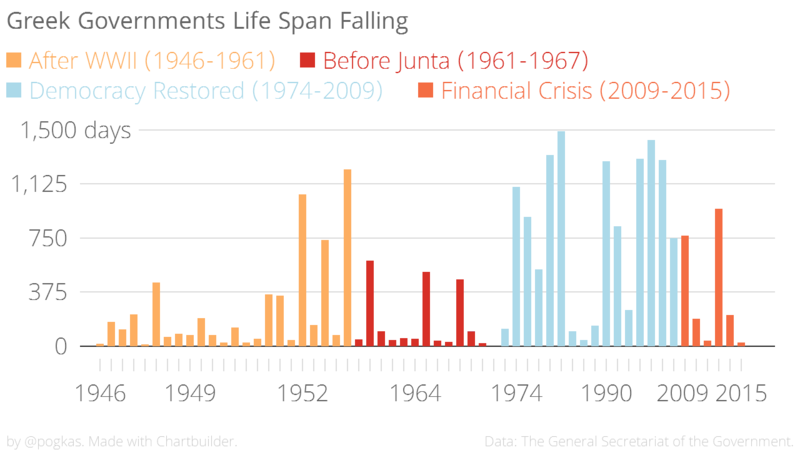 The restoration of democracy followed a prolonged period of political stability and calm3 up until the beginnings of the financial crisis in 2009. Now, my analysis shows that Greece returns to holding elections and changing governments – voted and interims – with a frequency that resembles its past political history. There is no valid indication - at least in the political foreground - that we are headed towards an immediate threat to democracy, but the Greek political landscape has slipped back to a state of instability that might affect the efforts of financial recovery and social cohesion. The economic developments of the last years affected the political landscape too, causing the collapse of the two main political parties PASOK (Social democrats) and Nea Dimokratia (Centre-right), as well as feeding the rise of smaller parties4 and the establishment of new parties or movements. The elections of May/June 2012 and January 2015 saw these new parties making into the Parliament, but the September election saw a kind of consolidation in the political landscape. The October 2015 Parliament of Greece is counting members from 9 different parties taking seats, but only one will be a new entry. SYRIZA, Nea Dimokratia, Golden Dawn, KKE, PASOK-DIMAR, Potami, ANEL, they all have been there before5, but Enosi Kentroon (Union of Centrists) made the 3% threshold6 for the first time since establishment in 1993. The political and media system for years perceived as a joke Enosi Kentroon and its leader Vassilis Leventis - a politician with his own multiple-year-running TV show, but they had already participated in 15 Greek and European Parliament elections, before finally making it. Disappointment in the parties of the past, social media and virality, and long-before-made ‘prophecies’ about the hardships Greece was going to get into due to the political and economic elites helped Leventis and Enosi Kentroon see their votes surging during the crisis. The joke in Greece has it that country’s biggest party is abstention. Once again, most people didn’t participate in the election; media reported that especially younger populations or first voters (18 years old) chose to not proceed to the ballot stations. This rate of abstention could skew the final rate each party wins. For example, a 7% of Golden Dawn among voters would translate to a 2% (and not entering the Parliament) should everyone was casting their votes. Having said that, it should also be noted that even the rates of abstention cannot be estimated correctly, as the lists of the population with the registered right to vote (18 years old and over, residents of the country, Greek citizenship holders) are hardly getting updated, and we often stumble upon media reports that the lists include dead people or people that have left the country and don’t exercise their right to vote. A fair estimation about the actual rate of abstention puts the number of the voting population at 8.5 million people, thus the abstention at the September 2015 election at 34.6% rather than 45%. Golden Dawn remained at the third place among political parties of Greece, but this time they found their biggest traction in the migration crisis that hit in waves the islands of the Aegean Sea, across the Turkish shores. They consolidated a 6-7% among those voted, but in absolute numbers they lost 8,806 votes across the country (a drop of 2.27% from the January 2015 election). They also lost voters in all the major urban centres (Attica and Piraeus, Thessaloniki, Achaia), but they manage to increase their rates in 37 out of the 51 voting regions7. The biggest rate increase for Golden Dawn was recorded in the islands of the Aegean and Ioanian Sea, and especially in those that were affected the most by the migrant crisis (Lesvos, Samos, Dodecanese, Chios). Traditionally, after the democracy was restored in Greece in 1974, Greeks have being mostly voting for the Left (centre-left, socialist, leftist, communist parties) rather than the Right. Since 2007, the gap between Left and Right in Greece seemed to be getting smaller. But at the September 2015 election, with SYRIZA and PASOK-DIMAR increasing their rates since last election the gap seems to be opening up again. 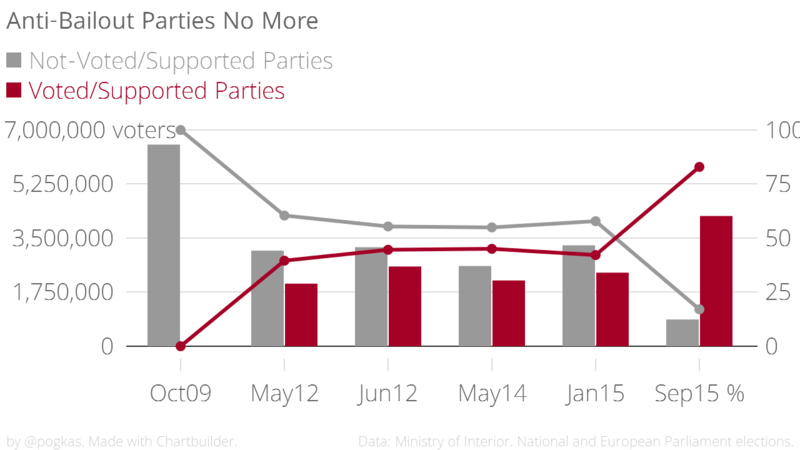 Although SYRIZA, the anti-bailout leftist party, voted for a third harsh bailout package, the opposition of Nea Dimokratia managed to lose votes in almost every region of Greece turning a head-to-head uncertain result - as depicted by the polls - to a defeat. The last 5 years the political landscape of Greece has been divided into those pro-Memorandum8 and those against. Now, with the only parties belonging to the anti-Memorandum front9 being Golden Dawn and the Communist Party of Greece (each one beginning from a different starting point of view), this division stands no more. Laiki Enotita - the party that was formed after two dozen of SYRIZA MP’s left the party because of the third bailout program - didn’t manage to enter Parliament, thus all the major Parliamentary parties are now standing behind the bailout packages and the austerity and reform measures they go with. 1Some parts of the Western World have transitioned to electronic voting, but for Greece result transmission through smartphones from each polling station to the company that oversees the whole process is something quite new. 2Again, something new for the greek reality, as so far the electorate was voting for candidates and the seats were taken, according to the rates of each party and the voting regions distribution, by those with the most votes. 3With the only exception being the 1989-1993 period. 4The most exemplar case being SYRIZA taking over power eventually. 5The 4 out of the 8 of them only after 2012. 6Under the Greek voting law, a party can take up seats in the Parliament only if they exceed a 3% rate in the election. 7I have consolidated the voting regions according to the regions police is splitting up the country in order to record migrants entries; Voting regions of Athens A’, Athens B’, Piraeus A’, Piraeus B’ and Rest of Attica into Attica and Piraeus; Thessaloniki A’ and Thessaloniki B’ into Thessaloniki. The other way around, Alexandroupoli and Orestiada were consolidated into the voting region of Evros and Dodecanese A’ and Dodecanese B’ were consolidated into Dodecanese. 8In greek, Μνημόνιο [Mnimonio]; the collective term used in Greece to indicate the bailout packages from the EU-ECB-IMF troika and the accompanying austerity and reforms measures the Greek governments have agreed to implement. 9In my data analysis I define as pro-Memorandum the parties that before an election had voted for or supported the implementation of the bailout packages. For September 2015 election it includes SYRIZA, ANEL, Nea Dimokratia, PASOK, DIMAR, To Potami.